Warm winter salad. It was the first thing I served in the restaurant back in 2012. You know, I must stop calling it that. It's a supper club, not a restaurant. Perhaps I should change the name to New River Dining? That's our Twitter tag anyway. Calling it a restaurant was a joke among friends who'd always told me 'we'd pay for your food'. 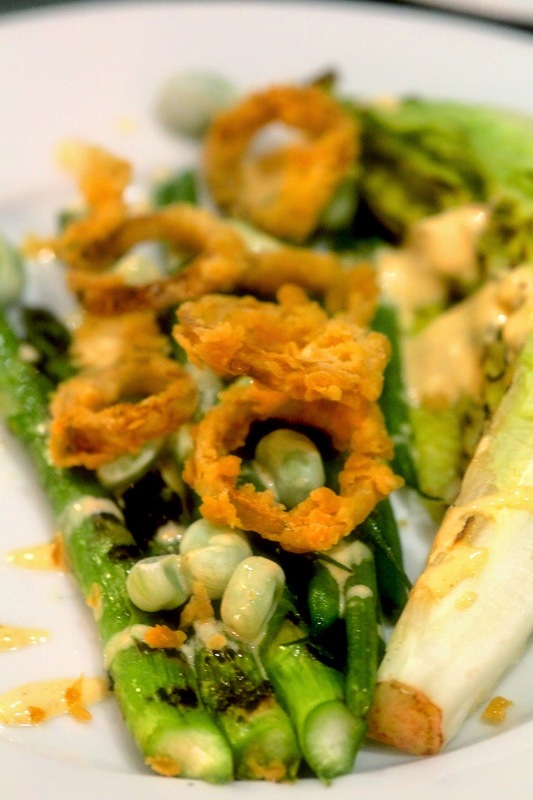 Back to warm salad: chargrilled baby gem and asparagus coupled with blanched beans, both green and broad, all dressed in either a mustardy vinaigrette or, more recently, a garlicky créme fraîche number (recipe below). I've always thought it needed something crispy to accompany it. I've tried toasted bread, croutons, seeds, nuts... and now I've found the perfact partner: shallot rings. Smaller and sweeter than onion rings and fresh from the deep fry basket these are crisp indeed with a biting crunch. They are so good I may well add them to other dishes. I can't stop eating them. I also can't believe I took two years to think of something so obvious. Eschalion, version as the more available round ones won't yield many rings. Sainsbury's never seem to do them, whereas Waitrose and Tesco do. In a bowl, whisk up a simple batter of one egg and equal weight of milk. Just guess, no need to measure. Dump all the separated rings into the batter and mix to coat. Now place the rings on a tray of seasoned flour and gently shake to coat. It's important to season the flour: salt and pepper obviously but maybe also smoked paprika or ground coriander. I find this way much easier then making a traditional batter which tends to slide off the slippery alliums as you transfer from bowl to basket. Deep fry in oil at 180°C until crisp and golden, maybe four minutes. They can be kept crispy in a low oven if you want to make loads. And you will. I have a dedicated (and very old) deep fryer. If you use a pan, take all the usual precautions. You're adults - I trust you. Not many people seem to have chip pans any more; the ubiquity of the oven chip perhaps. Or maybe because we're all middle class now. I almost never cook chips at home, oven or otherwise; maybe twice in five years. It's not that I don't eat them, of course I do. It might be because my father suffered terrible burns as a result of a chip pan fire when I was seven so am very cautious of using them. (Jeez, keep it light. The dressing I mentioned is Caesar salad style, based on créme fraîche. Here's the recipe. I've listed it before but it was buried among broad beans and French gnocchi. Mix 3 big tablespoons of créme fraîche with half a tablespoon of red wine vinegar infused with garlic. Ah, yes, I probably should have mentioned this. Put some crushed garlic in a jam jar, in the past, with some red wine vinegar and leave them jam-jarred in the fridge for a few days/weeks/forever. Both my parties went for the warm winter salad; Abigail on Friday and Lara on Saturday. Abigail (right, centre) and friends. What's the collective noun for pregnant women? A brood? A pride? A panic? Whatever it is, Abigail's pre-partum party was such - half the group being 'with child'. There were meant to be six but one guest was so pregnant she had to cry off at the last minute. Obviously this meant no soft cheese, liver or uncooked egg and very little alcohol. While I was prepping their main course - sous vide cod - I took this picture. Have a guess. Saturday was Lara's eight. A badly behaved camera meant I only have these not-brilliant pics to show. Sadly, Lara isn't very visible. Sorry. Still, I don't often show people eating, mainly because we pull some pretty ugly faces when we do (I cut those). So the picture, all pinks, greens and yellows, is the vinegar reduction for the chive hollandaise. That's shallots, peppercorns, tarragon and lemon zest. One last thing. 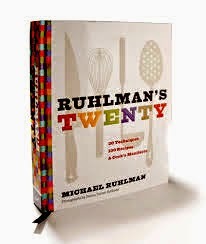 I've bought some new books by an American chap called Michael Ruhlman. One of them is called 'Twenty' and it's brilliant. He's broken down cooking into twenty areas such as 'onion', 'soup', 'braise' and 'roast'; master them all and you can cook anything. Interestingly, his first area is: 'Think'. Absolutely. If you're thinking of buying a child, a student or an irresponsible adult their first cook book, this should be it.